Frank Gore’s holdout from 49ers training camp won’t last long. Coach Jim Harbaugh said today that Gore has decided to end his holdout and will arrive at the team’s practice facility tomorrow. Gore will play under his current contract, although Harbaugh indicated that the 49ers are open to giving him a new deal. “We’ll earnestly look at that in terms of extending him,” Harbaugh said, per Matt Maiocco of CSNBayArea.com. Gore is due to make $5 million this season, the final year of his current four-year, $28 million contract. As we pointed out last night, the market for veteran running backs has gone soft, with guys like Marion Barber involuntarily trading in deals averaging more than $6 million annually for contracts worth less than half that. Giants running back Ahmad Bradshaw has been waiting for the kind of big-money offer that every free agent with name recognition and more than 1,000 yards rushing in his contract year believes he’ll receive. To date, it hasn’t happened. 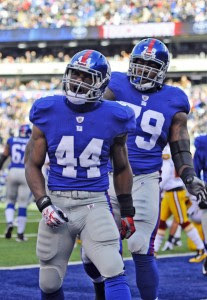 The most interest in Bradshaw has come from the Giants, but another player could be emerging. The Redskins, we’re told, recently have expressed preliminary interest. If it progresses, there could be an NFC East tug-o-war for two teams who’ll face each other in Week One. That said, Bradshaw doesn’t really fit the Mike Shanahan profile of little-known interchangeable backs who get their yards because they get great blocking. Either way, Bradshaw and other veteran running backs who got excited when DeAngelo Williams hit the jackpot will soon realize, if they haven’t already, that the Panthers are the only team that has treated the 2011 spending cycle like a remake of Brewster’s Millions. Last week, three teams agreed to terms with veteran players before any team technically was allowed to contact those veteran players. Two of those players, quarterback Vince Young and receiver Roy Williams, joined the Eagles and Bears, respectively, not long after the issuance of the Personnel Notice officially listing them as being released. The third player, Willis McGahee, had yet to join the Broncos. Amid reports of denials that an agreement in principle had been reached and explanations that the Broncos wanted to eyeball McGahee before offering him a contract, a league source tells us that McGahee has signed a four-year contract, worth approximately $10 million. The effort by the Broncos — and by the media to throw the Broncos a bone in order to keep the Broncos out of trouble with the league office — had become laughable. Once word got out of the agreement with McGahee before he appeared on the official Personnel Notice and after the league office sent an e-mail to all teams reminding them of the rule against contacting players who have not yet appeared on the official Personnel Notice, the Broncos tried to cram the toothpaste back into the tube. We realize that the Broncos don’t want to get into trouble, but we didn’t realize it’s the job of the media to help keep them, or any other team, out of it. UPDATE: One of the reporters who has been pushing the Broncos’ position contends via text that our original report of the three-year, $7.5 million deal in principle must have been wrong because the deal signed today is worth nearly $10 million over four years. The easy explanation is that another year was added at roughly the same rate to cover tracks. Either way, our prior report was accurate, and we’re not going to pretend that it wasn’t as a favor to the Broncos or anyone. The Chicago Bears added a pair of discarded players on Saturday, agreeing to terms with defensive tackle Amobi Okoye and running back Marion Barber, Vaughn McClure of the Chicago Tribune reports. A 2007 first-round pick by the Houston Texans, Okoye was not a fit in the Texans' new 3-4 defense and, after no team was willing to trade for him, was released earlier on Saturday. Several suitors quickly emerged and the 24-year-old from the University of Louisville agreed to a one-year deal with the Bears, where the 6-foot-2, 302-pounder will play the three-technique spot. Barber, 28, was released by the Dallas Cowboys in a cost-cutting move on Thursday. The 28-year-old is coming off his least productive season and was due nearly $5 million in total compensation in 2011. ESPN's Adam Schefter reports that Barber's two-year contract is worth $5 million. Barber has rushed for 4,358 yards and 47 touchdowns over the last six seasons, adding 174 receptions for 1,280 yards and six touchdowns out of the backfield. 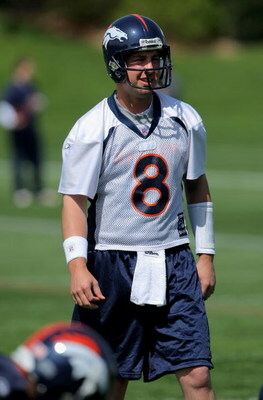 Kyle Orton will line up Saturday behind center for his third straight day as the Broncos starting quarterback. A possible trade to Miami has stalled at best. In Denver, they are saying the deal is totally dead. “There is no chance he will be traded to the Miami Dolphins,” Mike Klis of the Denver Post writes in a terrific breakdown of how the trade talks broke down. Klis says the teams were close to an agreement Tuesday night, but Orton started to have second thoughts. He has one year left on his contract (due to pay him $8.8 million this year) and didn’t want to delay free agency and lower his 2011 pay unless Miami gave him significant guaranteed money in a two-year deal. They balked. “Orton decided that if he was going to play on a one-year contract, he might as well stay in Denver,” Klis writes. The Broncos paid Orton a $1.5 million roster bonus Friday. Klis reports Orton gets $2.9 million of his base salary even if he’s cut. So the Broncos are in for $4.4 million on Orton this year no matter what. They can’t cut him now and probably don’t want to. The more Orton practices with the first team, the harder it will be to demote him. He’s playing with teammates that like him. He’s going to have an edge in practice as a veteran. Orton essentially bet on himself and the Broncos and Dolphins were caught flat-footed. We love it. The Eagles, moments ago, sent out a text message that will cause jaws to drop from sea to shining sea. 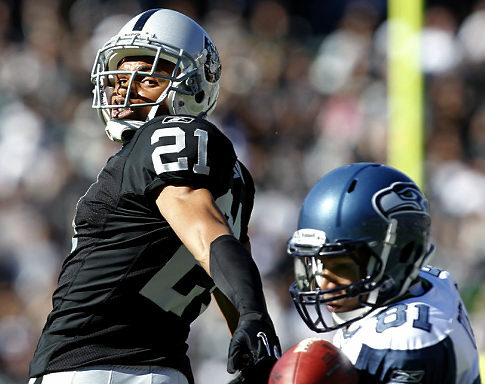 The Eagles have signed cornerback Nnamdi Asomugha. Per Adam Schefter of ESPN, the deal is worth $60 million over five years, with $25 million guaranteed. It’s not all that much richer of a deal than the one signed on the first day of free agency by cornerback Asante Samuel, who received a five-year, $57 million contract with $20 million guaranteed. And it’s a far cry from the contract that defensive end Charles Johnson will sign with the Panthers: Six-year, $76 million, $32 million guaranteed. As to Samuel, the move could mean that he’s available, given that the Eagles just acquired Dominique Rodgers-Cromartie on Thursday from the Cardinals. (Indeed, Samuel has not yet reported to camp, excused due to a personal reason.) Or maybe DRC could be on the move again, after serving the purpose of providing Philly with cover as they fooled everyone by pursuing Nnamdi in complete secrecy. Chris Johnson Tennessee running back will not be reporting for training camp with the Titans until he gets a new contract, according to a person familiar with the situation. 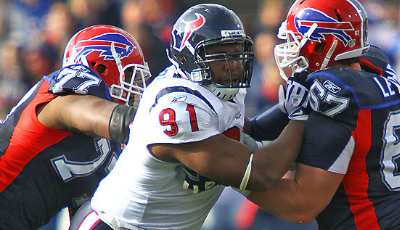 The person told The Associated Press Friday that Johnson will not report to the Titans. The person spoke on condition of anonymity because the decision had not been publicly announced. The Titans are scheduled to report for camp Friday with the first practice Saturday. The Tennessean first reported that Johnson would not be reporting. Johnson can be fined $30,000 for each day of camp missed, but the three-time Pro Bowl running back wants to be rewarded for his production over his first three seasons. He became only the sixth man in NFL history to run for at least 2,000 yards when he ran for 2,006 yards in 2009 and the first to rack up 2,500 yards with 500 yards receiving. He followed that up by running for 1,364 yards in 2009 despite finishing the season with a bruised thigh and has started 46 of the 47 games he has played in since being drafted 24th overall in 2008 out of East Carolina. Johnson has 4,598 career yards averaging 5 yards per carry and also has 1,008 yards receiving. Johnson is scheduled to make $800,000 in salary this season. DeAngelo Williams got a new deal from Carolina earlier this week worth $21 million in guaranteed money. He played only six games in 2010 and ran for 361 yards while dealing with injuries. As originally reported by Matt Barrows of The Sacramento Bee, San Francisco 49ers wide receiver Michael Crabtree's foot injury will keep him on the sidelines for a couple of weeks of training camp. The 49ers announced on Thursday night that Crabtree, rookie fullback Bruce Miller, and wide receiver Dominique Zeigler have been placed on the physically unable to perform list. According to Barrows' report, Crabtree could miss four-to-six weeks of camp, which would be the third straight preseason the 10th overall pick of the 2009 NFL Draft will have missed. Crabtree did not sign his rookie contract until October, and sat out last year's preseason games with a neck injury. 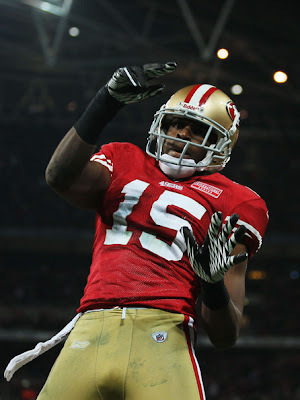 Crabtree re-injured his foot during the the player-run workouts at San Jose State University in June. In 27 games over his first two seasons in the league, Crabtree has 103 receptions for 1,366 yards and eight touchdowns. As expected, the Philadelphia Eagles will be filling their void at backup quarterback with a guy who has won 30 of 47 career starts. 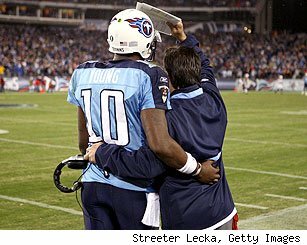 Vince Young, cut by the Titans and unwanted by any team that has an opening at starter, has agreed to terms with the Eagles, per Albert Breer of NFL Network. Young will sign a one-year deal. It’s a great move for both sides. The Eagles need a backup for Mike Vick, and Young will benefit from the coaching that Andy Reid can provide. The best news? That Favre-to-Philly talk can end less than a week after it started. For the second time in two days, a deal has been worked out for a high-profile player. And, for the second time in two days, the trade now hinges on the player working out an acceptable deal with his new team. Jay Glazer of FOX Sports reports that the Saints have agreed to the terms of a trade that would send running back Reggie Bush to the Dolphins. There’s also a chance that Bush will stay put in New Orleans, if he agrees to accept a reduced rate of pay. The move makes plenty of sense for the Saints, who would have had no choice but to cut Bush ASAP. If he tears an ACL or busts an Achilles’ tendon in training camp, New Orleans will owe him the full $11.8 million. Also, by trading him the Saints will be able to ensure that he ended up out of their division — and out of their conference. In the end, Bush’s place of employment for 2011 will come down to whether he wants to stay with the Saints or move on. Lately, he has been saying all the right things about New Orleans. His chance to prove that he means it has now arrived. Redskins head coach Mike Shanahan is adamant that relatively unknown John Beck(notes) can be his team's starting quarterback this season. The rest of Washington, D.C., has been a little slower to embrace him. He was turned away at the security gate by a guard, who didn't even know who he was. Beck was told that players can't report until Tuesday morning, and left slightly disappointed, but not offended. "I'm OK with that," Beck said of not being recognized when reached this afternoon. "I haven't done anything yet." If I was in the security guy's shoes that day, I believe I'd have done the same thing. I'm not sure I'd recognize John Beck if he walked into my kitchen right now and started making me waffles. Beck was drafted in the second round of the 2007 draft by the Dolphins. In two years with the Fish, he started just four games (with a spotless 0-4 record) and was unable to beat out Chad Pennington(notes), Chad Henne(notes) or the great Cleo Lemon(notes) for playing time. He spent 2009 wearing a Ravens uniform, but never got on the field. In 47 days, he could be starting for the Redskins. At a time when multiple teams were believed to be chasing veteran quarterback Matt Hasselbeck, the former Seahawk has decided to join the Titans. Adam Schefter of ESPN reports that Hasselbeck has agreed to terms on a multi-year deal. Titans beat writer Jim Wyatt of the Tennessean has confirmed it. It’ll be interesting to see the specifics of the financial package, given that the Titans used the eighth overall pick in the draft on quarterback Jake Locker. First-year head coach Mike Munchak recently said that he wants a veteran who can mentor and compete with Locker and Rusty Smith. 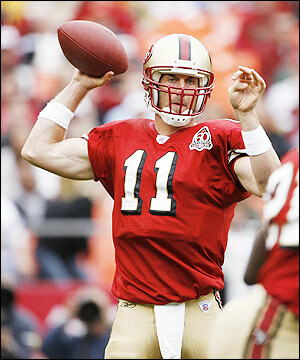 Hasselbeck was a backup for two years in Green Bay, before being traded to Seattle. He was the starter with the Seahawks for 10 seasons (my gosh has it been that long), leading the team to Super Bowl XL and numerous other playoff appearances. He has a career passer rating of 82.2, with 176 touchdowns, 128 interceptions, and nearly 30,000 yards. The San Francisco 49ers have agreed to terms with quarterback Alex Smith, keeping their former first-round pick in the Bay Area for at least one more season, ESPN reports. Smith's deal is worth around $5 million for the 2011 season. Chosen with the first overall pick of the 2005 NFL Draft, Smith has completed 57.1% of his 1,514 pass attempts for 9,399 yards with 51 touchdowns and 53 interceptions over the last six seasons, compiling a passer rating of 72.1. Smith took an active role in organizing the 49ers' player-run workouts at San Jose State University, and is expected is to compete with 2011 second-round pick Colin Kaepernick for the team starting job. ESPN.com's John Clayton reports that teams can talk to undrafted rookie free agents on Monday night, and sign them on Tuesday. After a day of conflicting timelines (thanks to some reports that were in conflict with reality), there’s a new conflict in the league’s timeline, thanks to the league. John Clayton of ESPN reports that teams have received the ability to sign undrafted free agents on Monday night. At some point on Monday afternoon, the league decided to permit the transactions, beginning tonight at 6:00 p.m. ET. Previously, negotiations were permitted with undrafted players tonight, but no deals could be signed until Tuesday. UPDATED: Tom Kowalski of Mlive.com tells us that, per multiple source, teams cannot sign undrafted players tonight. Too bad Kowalski doesn’t work for ESPN, or it would be the latest episode of the recent ESPN-on-ESPN crime spree. 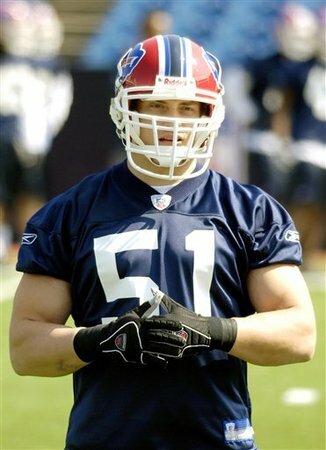 SECOND UPDATE: Mark Maske of the Washington Post confirms Kowalski, citing NFL spokesman Greg Aiello. So, basically, the Professor was a little nutty on this one. Teams can’t sign undrafted rookies yet. But they can, as the Professor would say, nego-see-ate with them. The undrafted players could also take a hit financially, like their rookie classmates at the very top of the draft. Bob McGinn of the Milwaukee Journal-Sentinel writes that the CBA will limit teams to a $75,000 signing bonus limit for their entire undrafted class. “Probably won’t see $20,000 signing bonuses for rook free agents anymore,” McGinn opines. The Cleveland Plain-Dealer wrote earlier this offseason that $3,000 was the average signing bonus for players, so it will only hurt the very top end undrafted options. It remains unclear when undrafted players would be allowed to sign. Wednesday is the best guess when they could start to negotiate, with the deals official 24 hours later. While walking the red carpet at the Starkey Hearing Foundation gala on Sunday, Minnesota Vikings guard and player rep Steve Hutchinson discussed the status of labor talks between the NFL and NFLPA. "I think, honestly, it's a good give-and-take," Hutchinson said according to Tom Pelissero of 1500ESPN.com. "I think there's some things that they wanted to go more their way -- and when I say that, I mean the owners' side. I think there's some things that we made some pretty significant strides in player safety. We got the economics figured out. There's a common language now. The economic side of it on our behalf is good. "All around, I think it's a good deal, and hopefully, we can just get it signed on the dotted line." 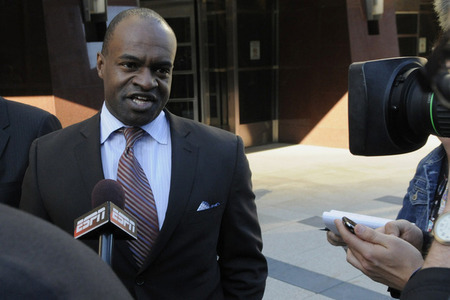 The NFLPA's executive committee is scheduled to meet on Monday in Washington, D.C.. Provided the two sides can put the finishing touches on an agreement, the committee is expected to recommend the agreement to the 32 player representatives, who will vote to recommend the agreement via conference call. "I think there will be some good news coming out (Monday)," Hutchinson said. The Patriots’ apparent need at outside linebacker grew a little more apparent Sunday. Shalize Manza Young of the Boston Globe reports that outside linebacker Tully Banta-Cain, who has led the team in sacks the last two years, underwent surgery Friday for an abdominal strain. He’s expected to miss roughly 4-5 weeks. Banta-Cain aggravated a previous injury during player-only workouts. Despite his solid stats the last two years, the Patriots could consider placing him on the reserve/PUP list for the open of the season if they don’t think he’ll truly be ready in Week One. This is the second injury that we’ve recently heard that occurred during this offseason, following the news on Lions tackle Jeff Backus. We won’t be surprised if more significant injuries are learned about in the coming days as teams and media begin to catch up players they mostly haven’t talked to this offseason. 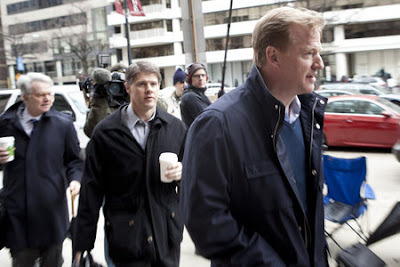 ESPN's John Clayton and Chris Mortensen report that there has been major progress in NFL labor talks on Saturday. Mortensen reports the 11-member NFLPA executive committee will meet Monday at NFLPA headquarters in Washington, D.C., where they could potentially recommend approval of a new collective bargaining agreement. If the executive committee votes to recommend the 10-year CBA and recertifying as a union, all 32 player representatives would be able to vote on recommending the CBA and recertification, as well. From there, the issue goes to the ten plaintiffs in the Brady v NFL antitrust case, with the final remaining hurdle cleared earlier on Saturday when requests made on behalf of franchised San Diego Chargers wide receiver Vincent Jackson were rescinded. NFLPA legal and financial teams have been going over the owners' proposal throughout the day on Saturday, while executive committee members have remained in contact via phone. The NFL Management Council Executive Committee also held a conference call on Saturday to discuss outstanding labor issues. Albert Breer of the NFL Network reports the two sides covered the opt-out clause in the CBA (players want one after seven years), worker's compensation, injury protection, and a process for the CBA talks if the players recertify the union. The players have to re-form as a union for several issues (drug testing, player discipline) to be collectively bargained. Jason La Canfora of the NFL Network adds that it's possible that the 2011 league year could begin on Wednesday with training camps opening on Friday. It's also possible that depending on when the two sides reach a "global settlement" that U.S. Magistrate Judge Arthur Boylan signs off on, free agency and training camp could begin on the same day. Howard Eskin of WIP radio in Philadelphia reports that if the Philadelphia Eagles trade quarterback Kevin Kolb, they would possibly be interested in signing quarterback Brett Favre to back up Michael Vick. Favre-to-the-Eagles would make sense as Eagles head coach Andy Reid and offensive coordinator Marty Mornhinweg coached Favre in Green Bay. The Eagles would also want an experienced backup to Vick, who missed four games during his Pro Bowl season in 2010 with various injuries. Mike Florio of ProFootballTalk.com passes along a rumor that made its way through NFL circles last week which had Favre approaching the Seattle Seahawks about replacing Matt Hasselbeck in 2011. The Seahawks declined interest and, since such contact is prohibited, deny that it ever happened. 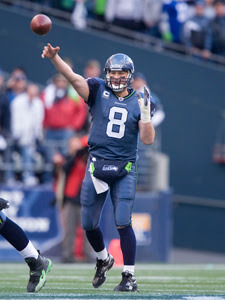 Hasselbeck is an unrestricted free agent who declined a contract offer from the Seahawks prior to the lockout. In January, the Seahawks named Darrell Bevell offensive coordinator. Bevell was the offensive coordinator for the two seasons Favre spent with the Minnesota Vikings. The NFL Players Association plans to continue talks through the weekend, Albert Breer of the NFL Network reports. Breer adds that there's urgency on both sides, but the players will not rushed into a deal they don't like because of that urgency. Earlier on Friday, ESPN's Adam Schefter reported that the NFLPA player reps emailed players to to say that they were reviewing the owner's proposal and would be meeting on Monday. Judy Battista of the New York Times reports that neither NFLPA Executive Director DeMaurice Smith nor Assistant Executive Director of External Affairs George Atallah know anything about that email. 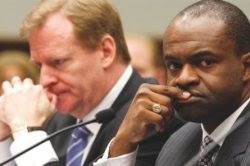 While continuing to try to figure out how the Executive Committee and board of player representatives of a supposedly toothless trade association has the power to keep the players from voting on the proposed labor deal that NFLPA* executive director DeMaurice Smith presumably has brought to the table with a recommendation to accept it, the light bulb finally has flickered. At this point the union can reconstitute and the labor deal can be accepted with only 50 percent plus one of the players agreeing with that approach. The opinions and positions and recommendations of the Executive Committee and the board of player representatives don’t matter. Come March 2012, they do. 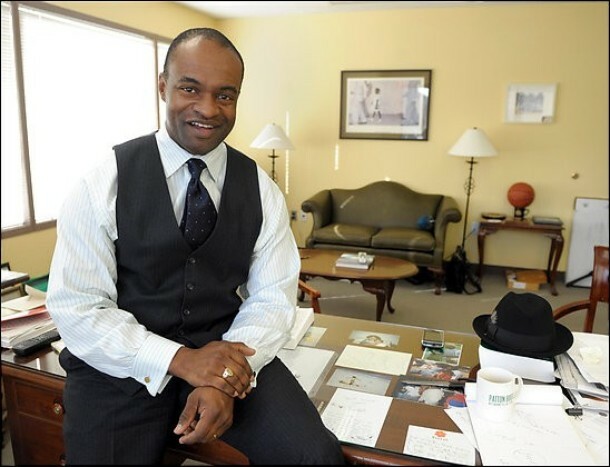 At that time, they’ll decide whether Smith continues to be the executive director of the NFLPA, with or without an asterisk. And so De Smith is tiptoeing through a mine field on this one. He knows that it he sends the labor deal out for a vote to all players, more than 50 percent will jump on it. But he also knows that, if he disrespects the Executive Committee or the board of player representatives, the next time he negotiates a labor deal it will be on behalf of one of the clients of his law practice. So even though what they say doesn’t really matter, Smith has no choice but to respect the current process. According to ESPN.com, the NFLPA has informed the 32 player representatives that the NFL's settlement requires the players to re-form as a union and provide evidence that a majority of players have signed union authorization cards by Tuesday, July 26. In addition, the league's settlement requires the players to ratify the proposed collective bargaining agreement by the 26th. The players would then have only three days -- Wednesday, Thursday, and Friday of next week -- to try and bargain any changes to the collective bargaining agreement. Any changes would be have to be agreed to by the owners in order to be incorporated into the agreement, which would become final on July 30. If the NFL does not agree to the changes, the old CBA terms on benefits, discipline, and safety will remain unchanged for another ten years. Mac's Football Blog has obtained a copy of the email sent to player reps by NFLPA general counsel Richard Berthelsen, and he believes the timeline violates labor law. "In addition to depriving the players of the time needed to consider forming a union and making needed changes to the old Agreement, this proposed procedure would in my view also violate federal labor laws. Those laws prohibit employers from coercing their employees into forming a union, and could result in any Agreement reached through the procedure being declared null and void." 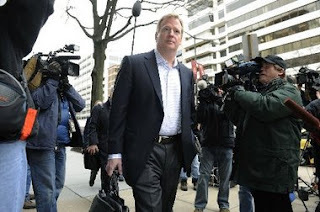 Scott Hanson and Albert Breer of the NFL Network are reporting that the NFL owners have voted to ratify the settlement terms of the litigation that would be the first step in bringing forth a new agreement. The vote took place just before 7 p.m. ET on Thursday, and the NFL Network's Rich Eisen reports that the vote was 31-0, with the Oakland Raiders abstaining. It was perhaps the most overwhelming initiative from the owners' side when it came to a settlement agreement or new collective bargaining agreement in the history of the league, and it sets the table for the players to vote on the global settlement put in front of them to put to bed the Brady v. NFL, collusion and lockout insurance lawsuits. The NFLPA will have a conference call at 8 p.m. ET to discuss the offer on the table, how to re-certify as a union and how best to go forward. "The clubs approved an agreement that was negotiated with the players this afternoon," NFL commissioner Roger Goodell said Thursday at a news conference. "In addition to approving that agreement, we also approved a supplemental revenue sharing system for the next 10 years. With this ratification, and the ratification of the NFLPA board, we will be prepared to open the training facilities beginning this Saturday. We will then be prepared to start the new league year next Wednesday, subject to the full membership of the players ratifying the agreement and re-certifying as a union." Goodell also said that the 2011 Hall of Fame game, which was to feature the Chicago Bears and St. Louis Rams on Aug. 7, has been canceled due to complications brought about by time constraints. The first actual preseason games would begin Aug. 11. "There's certainly a major effort made to get everybody knowledgeable and familiar with the CBA," Dallas Cowboys owner Jerry Jones told Breer after the owners meetings adjourned. "Obviously, there was a tremendous amount of give and take to get this agreement with the players. And you have questions — the owners had a lot of questions about the give part, for sure, in the negotiations. That's what you expect. Certainly, they felt that the process gave everybody the best chance to do what the players and the league wanted to do, and that's to have a better game for the fans." 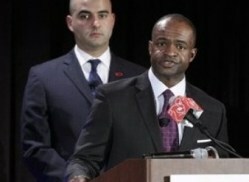 Through the day, union leader DeMaurice Smith and Goodell have been talking to resolve all outstanding issues, but it's important to note that the owners have essentially voted on their own proposal -- now, it's up to the NFLPA to meet them halfway. It's not the final step, but it's a big one. Stay tuned for more news through the evening as we know it. Veteran nose tackle Kris Jenkins plans to announce his retirement, Larry Hardesty of ESPN NY 1050 reports, via Adam Schefter. Jenkins posted the following statement on Facebook. "Wanted to let you all know that I have loved the support and respect that you all have given me throughout my career. But it is time for the torch to be passed to the younger players. I am going to hang up the cleats! The mind is always willing to play but my body deserves the rest. Thank you for the opportunities to play Carolina and New York." Jenkins, who turns 32 in August, is coming a pair of torn ACLs in his left knee during an 11-month span. Scheduled to earn $525 million in total compensation in 2011, the Jets released Jenkins in February. 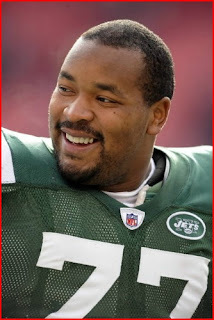 A second-round pick (44th overall) out of Maryland by the Carolina Panthers in 2001, Jenkins totaled 279 tackles and 24 quarterback sacks in 108 games during his 10-year career with the Panthers (2001-07) and Jets (2008-10). 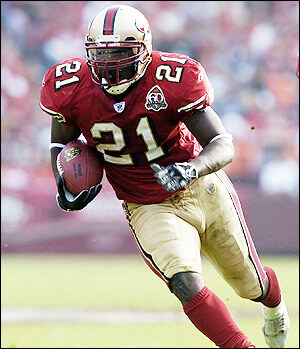 Jenkins earned Pro Bowl honors in 2002, 2003, 2006, and 2008, and was an All-Pro in 2002, 2003, and 2008. So everyone expected the NFL players to vote on a possible deal to end the lockout on Wednesday, and it didn’t happen. Since I’m not smart enough to understand why this might have happened, let’s collect a few reports from around the league to make sense of things. Mark Maske of the Washington Post passed along the same reason, with very similar wording from the players’ side. That would seem to indicate the delay isn’t a huge concern. Yet. One “key NFL source” thought the delay raised a “warning flag” according to Daniel Kaplan of Sports Business Journal. Most interesting was a series of tweets from Jim Trotter of SI.com. He writes that the players voted to “conditionally approve” the deal pending resolution of a few key items. NFLPA* class counsel will reportedly continue to work with the NFL in hopes of having agreement before NFL owners vote tomorrow. “The players vote is conditional, meaning they’re prepared to forward the settlement if certain issues can be resolved with the owners. One of the issues presumably is the $320 million the players lost in benefits last season during the uncapped year,” Trotter writes. 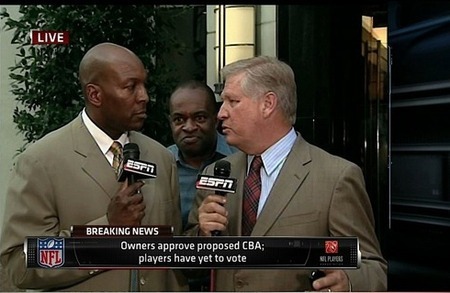 Chris Mortensen of ESPN echoed the idea, saying the players gave De Smith a “vote of confidence” to finish deal points. A final vote could take place via conference call. The deal isn’t done until it’s done. Apparently, some negotiations remain. This is a thorny, complicated process that is tough to hammer through quickly. 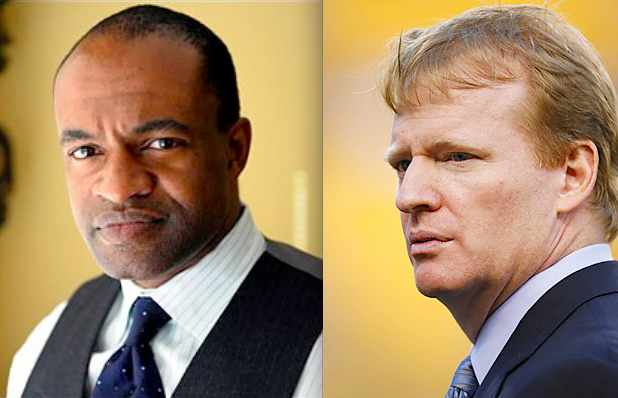 If the players truly left things in the hands of DeMaurice Smith, we cautiously doubt it’s anything to fret over. Smith is the one that brought the 32 player reps together because he had a deal he wanted to present to them. He’s clearly confident in a deal. Whatever the “certain issues” are, we’d imagine they can be resolved. Nearly 90,000 spectators showed up for the Indianapolis Colts' first training camp on the Anderson University campus since 1998. The school is still planning to host this year's camp, which is scheduled to begin on July 31, but a marquee attraction may not be on the field. Bob Kravitz of the Indianapolis Star reports that Colts quarterback Peyton Manning is still recovering from surgery in May to repair a disk in his neck and will not be ready for the start of training camp. 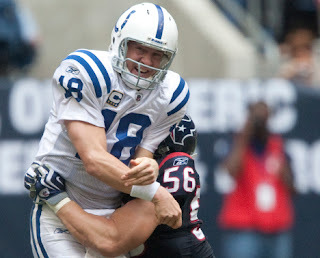 How long Manning will be sidelined is not known and won't be determined until the Colts' medical staff gets a first-hand look at Manning's neck. The Colts are expected to sign Manning to a multi-year contract after placing the franchise tag on the 11-time Pro Bowler in February. When the franchise tender is signed, which it likely will have to be in order for Manning to report to the team to be evaluated by the team's medical staff when teams can open their doors, it will carry a guaranteed base salary of $23.12 million. Following the procedure, which took place a little over nine weeks ago, Manning mentioned that he was a quick healer, referencing his 2010 neck surgery that only sidelined him for a couple of weeks. Colts owner Jim Irsay said the recovery period for this operation was "six-to-eight weeks". During his annual passing camp in Thibodaux, Louisiana earlier this month, Manning said that he was being cautious in his rehab due to the lockout preventing players from the team's facilities and trainers. "That's one thing these owners didn't take into account. You've got a guy rehabbing, and you can't use your training room and can't use your trainer," Manning said according to The Associated Press. "When you find a good trainer and a good rehab guy that you like, it's a pretty special bond. These guys kind of know your body. So the fact that I haven't had access to my guys and I've been somewhat on my own, I've been extra cautious and extra slow and making sure we don't have any setbacks." Previously, it appeared that the lawyers would work early into the evening in order to complete a draft of the labor deal, which will be presented to the players for discussion and debate on Wednesday. It now looks like it’s going to take a little longer. Albert Breer of NFL Network reports via Twitter that the two sides, negotiating at a law firm in Times Square, broke for dinner earlier in the hour (La Famiglia, anyone? ), and that they’ll thereafter reconvene. “Looks like a long night ahead,” Breer said. ESPN’s Adam Schefter has reported the same thing, which means it’s only a matter of time before Chris Mortensen of ESPN reports, citing an unnamed high-level source from some organization connected to the situation, that everything Schefter and Breer just said is wrong. UPDATE: Breer now reports that the lawyers’ work is largely done, and that the remainder of the evening will focus on dotting i’s and crossing t’s. Despite the uncertain labor situation and several teams declining invitations to appear, HBO still hopes to produce a "Hard Knocks" training camp series this summer, Vinnie Iyer of The Sporting News reports. "We are monitoring developments and remain hopeful of presenting a new season of 'Hard Knocks,'" HBO spokesman Raymond Stallone said. "Beyond that we are not going to speculate." 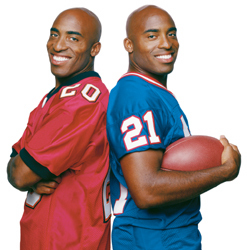 The series began in 2001 when cameras followed the defending Super Bowl Champion Baltimore Ravens, and continued in 2002 with the Dallas Cowboys. 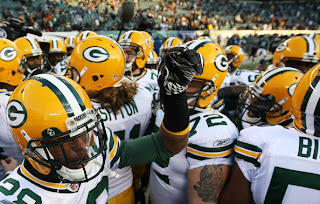 After a four-year hiatus, the series returned with the Kansas City Chiefs in 2007, the Cowboys again in 2008, the Cincinnati Bengals in 2009, and last season with the New York Jets. The Jets' series was immensely popular, thanks to larger-than-life head coach Rex Ryan, but the club has declined an invitation to make an encore appearance. The Tampa Bay Buccaneers, Atlanta Falcons, and Detroit Lions have also declined the chance to appear. Mike Florio of Pro Football Talk reports the Green Bay Packers are telling their players that the doors to their facility will be open on Friday. Florio adds that the Packers are making it known that the players should be ready for a meeting on Saturday. 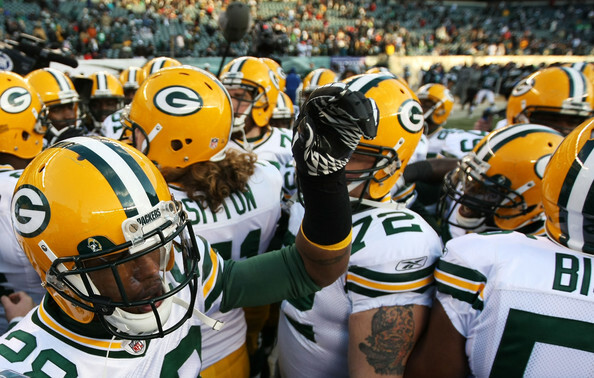 Jason Wilde of ESPN Milwaukee and Aaron Nagler of cheesehead.tv have confirmed the reports, with Nagler adding that one source indicated the team had received permission from the league to contact players. As the Brady antitrust action chugs toward conclusion, Ron Borges of the Boston Herald points out that, to the extent the settlement of the lawsuit depends on the approval of the men whose names appear on it, Patriots guard Logan Mankins could demand that he not be subject to the franchise tag in exchange for dropping the case. Borges points to a dynamic we’ve mentioned several times — the fact that the plaintiffs in the Reggie White antitrust lawsuit received a lifetime exemption from the franchise tag as part of the 1993 settlement. But that case was about securing free-agency rights, not about countering the league’s lockout leverage. Before Saturday, when word emerged for the first time that the NFLPA* wants to restrict the franchise tag to only one year per player, there had been no suggestion that today’s players were disputing any aspect of the pre-2010 free agency rules. Last time around, the NFLPA decertified after a failed strike, and after months of litigation ultimately secured a verdict that resulted in a settlement providing real free agency. This time, the NFLPA shut down when backed against the wall via the threat of a lockout, and real negotiations toward a new labor deal began less than three months after the case was filed. It arguably would represent the height of selfishness, then, for Mankins or any other named plaintiff to dig in his heels and request a cookie, especially since Mankins was at best an absentee litigant, participating in (as far as can tell via Google) none of the grueling and time-consuming talks that have placed the parties on the precipice of an agreement in principle. Borges’ column seems to be sufficiently informed to suggest that someone close to the talks fed him with the idea, and with the notion that Mankins perhaps would accept in lieu of free agency the money he would have made if he hadn’t held out for a large chunk of the 2010 season. And so the pink champagne remains on ice. Hopefully, we won’t eventually have to hit someone upside the head with the bottle. As ESPN’s Chris Mortensen reported earlier today, the players want $320 million in benefits that weren’t paid during the uncapped year, as well as a one-year limit on the use of the franchise tag. Also, if the “lockout insurance” case must be settled separately and apart from the financial package negotiated by the league and the players, it’s possible that another nine-figure sum could be demanded. And to the extent that the Brady antitrust lawsuit needs to be resolved via something more than the contents of a new CBA, the players still could demand even more money and/or special treatment for the named plaintiffs, such as an agreement never to use the franchise tag on any of them. 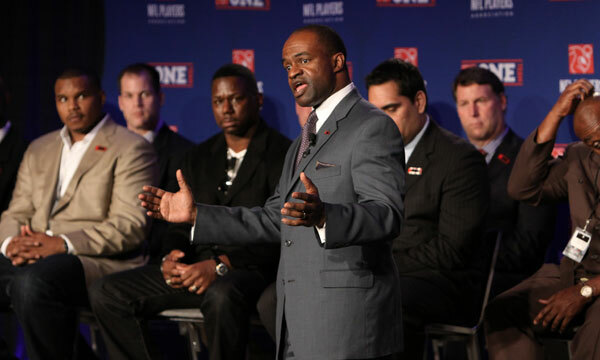 With a deal now regarded by the media and fans and players and pretty much everyone else as a foregone conclusion, the NFLPA* has by all appearances opted to go for one last home run, possibly buoyed by the league’s decision to cave on the “right of first refusal” concept and the league’s significant concession on the rookie wage scale. In theory, if the league calls the players’ bluff — and if it ends up not being a bluff — the whole thing could still blow up. Given the dramatic progress that has been made on far thornier and challenging issues, we can’t imagine the talks crumbling now. Instead, the players likely decided to roll the dice in the hopes of making the deal a little (or, as the case may be, a lot) sweeter, and if the parties can’t work out these remaining issues on their own, then U.S. Magistrate Judge Arthur Boylan will go Alton Benes on anyone and everyone in the room. Sure, there’s a chance that the NFLPA* lawyers are hoping that cooler heads won’t prevail, but the failure to wrap this thing up now would create a significant backlash for everyone involved. Roger Goodell and DeMaurice Smith are in the home stretch of the ultimate three-legged race, and they’re smart enough to figure out what it takes to get to the finish line. One of the issues in the NFL labor talks that the owners have been pushing for was to have the right of first refusal on their free agents this offseason. Even after the two sides agreed on the economic issues in the deal, the right of first refusal was still on the owner's wishlist. ESPN's Chris Mortensen reports that the owners have dropped that proposal, and will have a 72-hour window to re-sign those players before the unrestricted free agent signing period begins. Settling the litigation -- the Brady v NFL case and television damages case -- is all that remains, which means the NFL and NFLPA are clearly on the fast track to a deal. According to ESPN's Sal Paolantonio, the resolution of the rookie wage scale issue has led to significant progress on other issues and that the two sides are headed towards a settlement. "Both sides are intent on working through each issue line by line to get this deal done," a source told Paolantonio, who cautions that the work that needs to be done could "scuttle the deal". Talks have continued well into Thursday night, will continue on Friday morning, and may extend into the weekend. The owners and players are due to appear before U.S. Magistrate Judge Arthur Boylan in Minneapolis on Tuesday, July 19. To save a full training camp and preseason, the owners hope to have a deal that can be ratified by the 32 owners at their league meeting in Atlanta next Thursday. ESPN's Adam Schefter reports that the National Football League and NFL Players Association have agreed on a rookie compensation system. "Still i's to dot, t's to cross on rookie system, but it's not impediment to deal," Schefter tweeted on Thursday. The rookie wage system was believed to be the main issue entering this week's negotiating sessions in New York City. Other issues will need to be resolved before a new collective bargaining agreement is agreed upon, and it's important to keep in mind that a resolution in one area won't necessarily lead to a series of dominoes falling. But a major hurdle in the talks being cleared is a positive sign that we're getting closer to the end of the lockout and beginning of the 2011 league year. 36-year-old free agent kicker Matt Bryant hopes to play a few more seasons in NFL, which could give him a chance to kick for his friend and former head coach Jon Gruden, whom Bryant thinks will return to an NFL sideline in 2012, Joe Kazmar of The Record reports. "Gruden was 100 per cent committed to his job and was always very focused on what he was doing," Bryant said. "He got fired right after he signed a three-year extension. I believe Gruden will return to coaching after this season when the money from his extension runs out. We are still very good friends." Gruden compiled a 95-81 regular season record and 5-4 post-season record in 11 seasons as a head coach in the NFL, beginning with the Oakland Raiders from 1998-2001 and continuing with the Buccaneers from 2002-08. The Buccaneers won Super Bowl XXXVII in Gruden's first season in Tampa, beating the Raiders 48-21. Now an analyst on ESPN's Monday Night Football, Gruden has been linked to several head coaching positions, both college and pro, over the last three years. Gruden has also declared himself the head of the "Fired Football Coaches Association" and has been putting the top quarterbacks in the NFL draft under the microscope in the "Gruden's QB Camp" series on ESPNU. 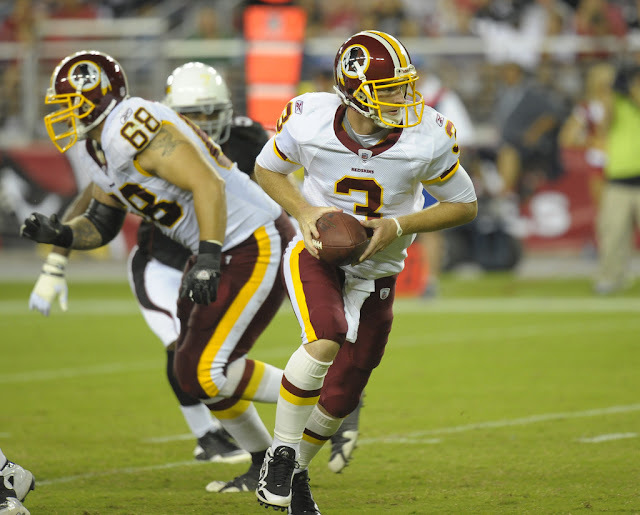 During the first episode of 2011, Gruden was telling University of Washington quarterback Jake Locker that thick skin was a necessity in the NFL, pointing out that even a Super Bowl win didn't keep him from being fired. Gruden added that "he'll be back someday". "Someday" may be January 2012. Tampa Bay Buccaneers cornerback Ronde Barber decided to return for a 15th season in the NFL, signing a one-year deal in February. At 36-years-old, Barber is the oldest player on the NFL's youngest roster. With age comes wisdom, and Barber has some advice for talented, but troubled cornerback Aqib Talib. "If I had any guidance for Aqib it would be to make him focus on football," Barber said according to Rick Stroud of the St. Petersburg Times. "Everybody has priorities, and I'm not one to tell anybody what to do with their lives, but we all know that football has got to be something that defines him, not all this other stuff. "Aqib is a person that should be...the confident Buc," said Barber. "But he's got to embrace Tampa the way Tampa as the team wants to embrace him. Warren (Sapp) was great with that. He knew the team atmosphere was better when everybody is around. There's a culture, a spirit, and nowadays (players) want to go back and train wherever they are. "That's different than from when I was coming up. We always wanted to be around." Barber isn't so sure the Buccaneers will sign his brother, Tiki, who is making an NFL comeback this offseason after retiring following the 2006 season. "I don't know how realistic it is now," Barber said of playing with his brother, who has listed the Buccaneers on hi short-list of teams he'd want to play for. Eagles quarterback Mike Vick has recaptured his earning potential on the field. And he’s getting back his ability to generate off-field money, too. 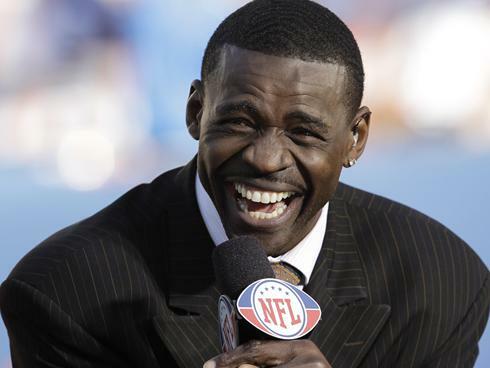 Jason La Canfora of NFL Network reports that Vick soon could sign a three-year, $1.55 million deal with MusclePharm, which makes supplements and other workout-related products. Though Vick has a long way to go to catch Peyton Manning in the advertising sweepstakes, no one reasonably expected Vick to ever rebuild his ability to sell products after serving time in a federal penitentiary for dogfighting and gambling. With Nike back in business with Vick, it looks like the stigma has been overcome by the sizzle. 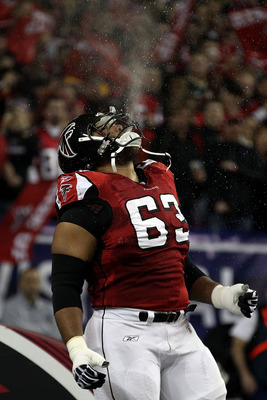 Falcons would only be able to keep two of their three starting free agent offensive linemen at best. It appears they are ready for two of three to leave. Jason La Canfora writes via sources that the Falcons “figure” guard Harvey Dahl and tackle Tyson Clabo will get big deals elsewhere, and are “prepared for contingencies” for both leaving. Translation: They don’t expect to keep them. Left guard Justin Blalock wasn’t mentioned and will presumably be retained if at all possible. The Falcons have drafted heavily on the offensive line the last two years to prepare for this day, and apparently trust their system and young players enough to let Clabo and Dahl walk. I admire Cowboys receiver Michael Irvin for proclaiming that he’ll support any gay NFL player who comes out of the closet during his career. And it’s important for more and more people in positions of influence to express similar views, given that gay players certainly have played and are playing every type of professional sport, striving to keep that secret for fear of being bullied, berated, and ultimately rejected. Ultimately, the issue hinges on the NFL’s ability to ensure that gay players will encounter no hostility in the workplace. In many respects, football teams have been immune to the societal advances of the last 50 years. Other than racial equality (which still may not completely exist), misogyny and homophobia are alive and well, making it impossible for any player to come out of the closet while still in the locker room. Tolerance needs to come from the top of the organization, along with a commitment at each level of management to insisting on an attitude and atmosphere of respect. Currently, that’s simply too much to expect. Teams won’t cut Pro Bowlers who don’t want homosexual players in the locker room, period. The alternative would be to ensure acceptance from the bottom up, with the players banding together to apply pressure to anyone who may resist the presence of a gay player. But even though Irvin now says that the Cowboys of the 1990s would have supported a gay player, we find it hard to believe that the man who stuck a pair of scissors in the neck of Everett McIver would have been leading the charge for inclusion and diversity. Surely at some point in the 1990s a gay player played for the Cowboys. If he believed that he would have been fully supported and accepted by the organization, he would have decided to stop living a dual life. Then there’s the question of harassment from fans, a group of folks that no front office can fully contain or control. Though a gay player surely wouldn’t be booed when introduced to the crowd, he’ll hear from pockets of the assembled public hurtful words that he otherwise wouldn’t hear if he remains in the closet. In the end, perhaps the only way to ever get to the point where sexual orientation is a non-issue in pro sports is for a player to declare his homosexuality during his career, not after it ends. History would possibly regard that player as the new Jackie Robinson, and that status would be earned via the various indignities to which the player would surely be subjected, at least in the short term. It’s by no means cowardly for a gay player to decline to accept that risk. It will take a special kind of courage to do it. At some point, it’ll happen. And if enough voices immediately express support for the player who becomes the first one to decide to quit living in fear, it may not be long before an “I am Spartacus”-style string of players decide that the burden of secrecy far outweighs the price of the truth. As the NFL and the players attempt to iron out whatever wrinkles remain in the labor negotiations, the lawyers are expected to spend Tuesday dwelling on the details before the principals return to the room. Both Albert Breer of NFL Network and Sal “45 Down” Paolantonio of ESPN reports that the owners and players, along with Commissioner Roger Goodell and NFLPA* executive director DeMaurice Smith, will be back on Wednesday. Per Breer, the lawyers for the two sides met for roughly five hours on Monday, after caucusing privately. They’ll get together again tomorrow. Paolantonio says that mediator Arthur Boylan will monitor progress via e-mail, and that he’s available for “a short phone call or two” if necessary. Though we respect Boylan’s ability to take his vacation, speaking from the perspective of a guy who’s currently on vacation, there’s plenty of time in the day to take a short phone call or two. The league has dug in, in large part because the league surely believes that the players eventually will cave. And it’s easy to argue that they should. The ability to sign first-round picks for up to five years doesn’t mean that they all will sign five-year deals. The same dynamic that has resulted in teams holding the first few picks grossly overpaying in the hopes of getting the players into camp will get those teams to agree to four-year contracts, if that’s what it takes to get the top picks signed. But to the extent that a compromise is needed, here’s an idea that’s currently making the rounds. For first-round picks, the contracts would have a three-year base term. After the third season, the teams could then pick up an option for one more year, at a predetermined level of compensation based on performance. Alternatively, teams could pick up two more years, at a much higher rate of pay. (If the player has been a bust, the team can at that point simply walk away.) The terms of the fourth-year and fifth-year options would be subject to negotiation, with hard ceilings on the most that could be paid. Then again, why does there need to be a hard ceiling on what a player would be paid in years four and five? If the first overall pick is on track for the Hall of Fame after three NFL seasons, why should his pay in years four and five be artificially restricted? This gets back to a point we’ve been making for weeks. The league seems to be crafting proposals that go beyond merely solving the problem of paying windfalls to players who ultimately do nothing to earn their money. At some point before the first-round picks spend five years in the league, we’ll all know whether they deserve big money. Thus, the league should not insist on locking those first-round picks up for five full years at a level of pay that doesn’t compensate great play. In this regard, the league is banking on the possibility that the growing sense of inevitability will eventually prompt enough of the players to say, “Screw it. It only affects a handful of players, none of whom are me.” But if the league is truly concerned about a win-win deal that is fair to everyone over the long term, the league will uncross its arms and think of creative ways to prevent Cam Newton from becoming the next JaMarcus Russell without punishing Newton if he becomes the next Peyton Manning. Until that happens, blame the league for the current state of the talks. Buffalo’s struggling defense could lose two of its better players with linebacker Paul Poslusny and cornerback Drayton Florence set to be free agents. In the PFT team checklist for the Bills back in May, we called Posluszny was the team’s most important free agent. He could be tricky to keep, but he’s not someone that wants out of Buffalo. Pat Kirwan of NFL.com reports Posluszny told him that he wants to return to the Bills. It will be a tricky negotiation. Posluszny is a team leader and the Bills could sorely use some continuity on defense. Then again, they may have to pony up top-ten linebacker money for a player that has been very good as a pro, but not exactly a gamebreaker. It sounds like Posluszny will give the Bills every chance to keep him. At this stage, they don’t have the luxury to let quality leaders walk away. Breer outlines the key sticking points, the most important of which is the league’s insistence on five-year deals for first-round picks, and the players’ preference for four-year contracts in round one. He explains that one league proposal includes a trigger that would “push the fifth year to 150 percent of an average starter’s salary at his position, with a floor of $6 million and a ceiling of $12 million” for the first eight picks. With the return of the salary cap and a salary floor that is expected to approach, if not exceed, 95 percent of the spending maximum, there’s no reason for the league to demand a system that goes beyond the placement of reasonable limits on the money paid to the top 10 draft picks. In fact, the presence of a slim gap between spending maximum and spending minimum arguably makes the entire draft unnecessary. We know it’s sacrilegious to suggest an NFL without a draft, but why shouldn’t teams that are required to spend almost as much as they’re permitted to spend not be able to spend as much, or as little, as they want on rookies? Free agency didn’t create chaos in the NFL — and we’re now starting to come to the conclusion that, with a hard cap and a hard floor not far below the hard cap, the lack of the draft won’t impact competitive balance. Of course, the draft remains an important part of the offseason hype machine, making it highly unlikely that it ever would disappear. So why not cut it down to three or four rounds? No one cares about rounds five through seven, and the new dynamics of the salary cap and floor will provide teams with every incentive to spend smartly when signing new players, regardless of whether they’re veterans or rookies. Again, we doubt that any changes to the draft will be made. But as the two sides look for ways to put this issue to bed, they need to be willing to be creative, in light of the realities of the new salary floor. 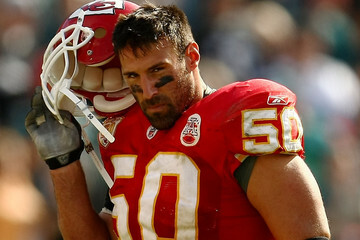 Two days ago, our own John Taylor of CFT beat all the big boys to the punch, reporting that there’s a “very good chance” Chiefs linebacker Mike Vrabel will retire and join Ohio State as the team’s new linebackers coach. Per the report, on Monday Vrabel will simultaneously retire and become a member of the Buckeyes’ coaching staff. Vrabel, a 14-year veteran, spent his first four seasons with the Steelers. 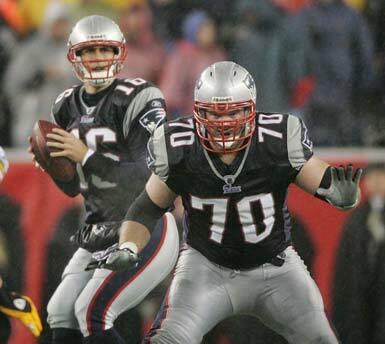 In 2001, he jumped to the Patriots, just in time to earn three Super Bowl rings in four years. 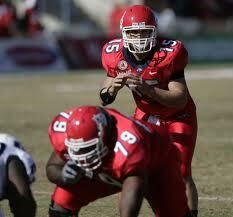 He was traded along with quarterback Matt Cassel to the Chiefs in 2009. The linebacker often played offense in goal-line situations. He racked up 10 career touchdown receptions, all of which came from two yards or shorter. He also caught touchdown passes in Super Bowl XXXVIII and XXXIX, both Patriots victories. While Brandon Lloyd and the Broncos receivers may not have loved seeing Josh McDaniels go, one group of Broncos had to be thrilled when John Fox was hired: The offensive linemen. After years of throwing the ball a ton, the Broncos figure to be a run-heavy team this year. Klis points out that John Fox called runs on 54% of plays in Carolina from 2008-2009. (Shanahan and McDaniels were around 40% between them.) Even last year when his team usually trailed big, Fox kept the Panthers balanced. Klis thinks the Broncos may run the ball two-thirds of the time if Tim Tebow is at quarterback. That number sounds high, but it helps to illustrate the mindset Fox brings. It makes us think the Broncos won’t be shy about signing another running back to pair with Knowshon Moreno, possibly Fox’s old player DeAngelo Williams. 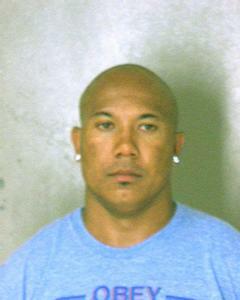 In a statement to TMZ.com, the manager for Pittsburgh Steelers wide receiver Hines Ward apologized for being arrested in Dekalb County, Georgia last night, but denies being under the influence of alcohol. 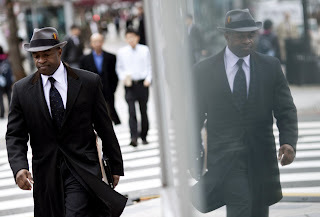 "He cooperated fully with the police and truthfully answered all of their questions. We are currently in the process of ascertaining all the facts," Andrew Ree said. "From our preliminary investigation we can tell you that we are confident that the facts will show that Hines was NOT impaired by alcohol while driving. "However, Hines is deeply saddened by this incident and apologizes to his fans and the Steelers organization for this distraction." Regarding the status of quarterback Donovan McNabb, Redskins coach Mike Shanahan was put on the spot by a seven-year-old boy at a youth football camp on Friday. 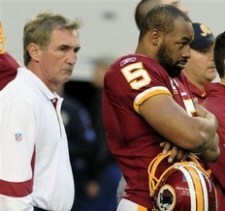 “Do you think Donovan McNabb will be back on the Redskins?” the boy asked, per CSNWashington.com. “The scenario.” “Tough decisions.” “Best interest of the team.” It sounds like Shanahan is planning to give his 34-year-old quarterback the axe. We suspect Shanahan’s actions before this season will indicate he believes there are better quarterbacks in the world, though.